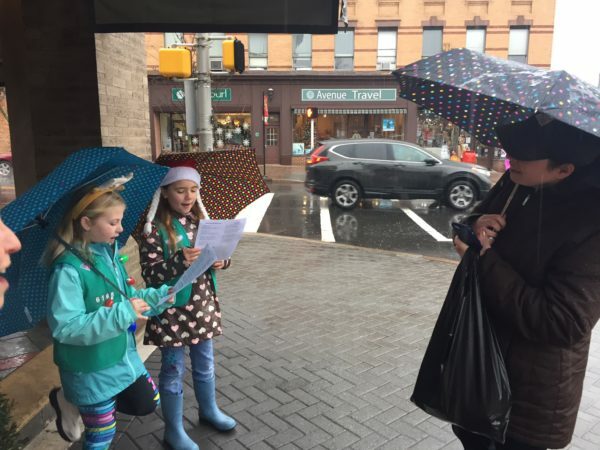 In early December, Lisa Ellis, the Director of Business Development for Madison, reached out to the Madison Girl Scouts to see if our troops could sing carols to shoppers. My fourth grade troop had sung carols at a local senior living facility for the past three years, but this year just got away from us and we couldn't find the time to plan our visit. So, we were very excited to have the offer to sing around town. We chose the later date offered, which was Saturday, December 23, and a few girls and their families were planning to come sing. Fortunately, we had not chosen the earlier date offered since it turned out to be a snow storm, and caroling was canceled. As our date approached, we watched the weather forecast. No snow predicted, but the little rain cloud just would not go away from our weather app. As the cold drizzly day approached, we debated whether we should cancel. Lisa left it up to us if we wanted to sing. A "no pressure to carol in the rain, we completely understand if you do not want to come" email was sent out to the troop. I knew that it was very close to the holidays and many of the girls were already suffering from colds. I asked my daughter if she wanted to still carol in the rain. She will sing any opportunity she can get, and she determined that the rain wasn't going to stop her. So, off we went, with rain boots on our feet and umbrellas in our hands, not expecting any other Girl Scouts to show up. Happily, her friend and fellow Girl Scout, Gillian, (and her awesome mom!) did! The two girls immediately jumped up on the step outside Rose City Jewelers and started singing their hearts out! Frosty the Snowman! Jingle Bells! Dashing Through the Snow! The mom of one of their classmates was on her way to the shoe store, and stopped for a few songs. She even called her husband who brought their son to sing a few carols with them! A college-aged couple stopped to listen to a song, and several passengers of cars stopped at the traffic light on Main Street rolled down their windows to listen as they waited for the light to change to green. An older couple in a car gave them around of applause, and some new parents put down their back window so their baby could listen! Huge smiles all around! After a few carols on the corner, the girls headed up Main Street. The other mom and I took turns going into the stores to ask the employees if the girls could sing (and they all said yes!). The workers at Healthy Italia all stopped to listen, gave the girls a free focaccia bread, and loved that the girls asked how to say Merry Christmas in Italian. The next stop was Bagel Chateau, which was packed! Their biggest audience the whole day! All the workers peeked over the counter to watch (and a few took pictures), and the customers all sat and smiled as they finished their food. The girls beamed as they received a huge round of applause and cheers of "Encore"! Further down the street, they sang to shoppers in Short Stories, then headed around the corner to San Francisco. There were just three workers/owners n Francisco, but I think they had the most beautiful reaction to the girls' carols. They were so welcoming and asked to take pictures with the girls. Further down the street, at Chatham Book Sellers, the girls chose to sing Frosty the Snowman. Then they got to the "Thumpity, thump, thump" chorus, the girls stomped their feet on the old wooden floor, which made a great sound! Customers all peered from between the book cases to watch our happy girls! A quick song at the Museum of Early Trades and Crafts was followed by a stop in at Madison Pet Shop. The store was having a cat adoption day, so after the girls oohed and aahed at the kitties, they sang for the cats (and other customers, of course!). Off to LaLa Land, where the workers and customers all smiled then offered the girls chocolates. They lead us to a special table around the half-wall that was filled with boxes of fancy "real" chocolates, as the girls called them, not just Halloween candy chocolate. Next was Lenny's Empanadas. Lenny was about to head to the back to get some supplies, but as soon as the girls started their rendition of Feliz Navidad, he said he had to stop and listen! Then a nice reception at Frattelli's (where they even gave the girls free bottles of water!) and Tons of Toys, then our final stop at Blue Purl, the beautiful yarn and knitting shop. A knitting circle was taking place at the huge table, and about 10 ladies were chatting and working on their knitting projects. Their eyes lit up when they saw our girls come in wearing their green Girl Scout vests, and many of them reminisced about their own days as a Girl Scout! As the girls sang, they ladies all clapped and sang along. Despite the dreary weather, our girls (and us moms!) had a wonderful time spreading happiness around the town!